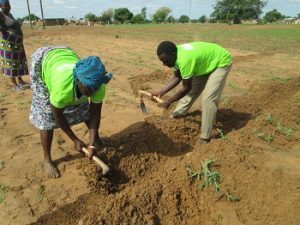 Due to a rapidly changing local environment, farmers in Upper East Ghana are teaching each other climate-smart farming techniques to great effect. 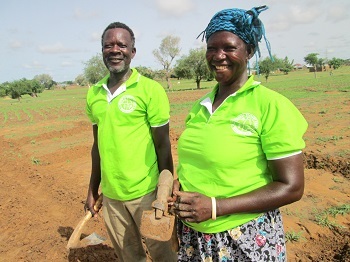 Mr. Akolgo, left, and Madam Adukpoka in the demonstration plot. In Zobugo, a small village in the Upper East Region of Ghana, Akolgo Abei-inga talks about why climate-smart farming is so critical. “There are noticeable changes with the weather and climate. For example, when I was a child, we used to plant our millet in March or April to coincide with the rains in late February/early March. But now we start planting in May or even sometimes as late as June. This year  for example, most farmers including me started planting their millet in June due to the late start of the rains,” he said. 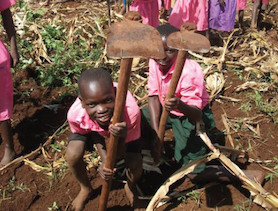 So Mr. Akolgo decided to do what he could to help farmers in his community adapt to the changing climate. Supported by Canadian Feed The Children’s local partner, Trade Aid Integrated, he established a demonstration farm on his land, and is sharing his time, skills and resources with others. Madam Adukpoka says that her yields have increased thanks to the new techniques she learned. Madam Adukpoka Alemiya is one of his star students. 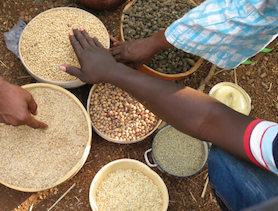 As a result of techniques that she learned from Mr. Akolgo, Madam Adukpoka has doubled her yield of rice, groundnuts, maize and millet and is growing diversified crops year round. Furthermore, she has increased her income from GHȼ 1,200 to 3,000. “Before learning on the demonstration farm, I was finding it very difficult to adequately feed my children nutritious food throughout the year. 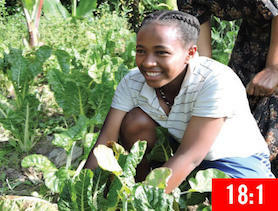 Since then, I have been able to increase yields from my farms through the practice of climate-smart techniques,” she said. “By using these techniques, I now have enough to feed my family and sell the surplus to buy other food items I do not produce. I can feed my children adequately with nutritious meals throughout the year which has improved their health status. I am also able to buy their books and pay their school fees,” Madam Adukpoka added. Mr. Akolgo hopes all farmers in his community will practice climate-adaptive farming to gradually restore the natural vegetation and forestation. “It is my dream that in the next ten to twenty years, this community will look greener than it is now,” he said. Under his tutelage, not only has Madam Adukpoka improved her own life and that of her children, but she has been inspired to pay it forward. “My hope is to mobilize my fellow farmers to practice climate-smart techniques so that they too can benefit from this approach. I also hope to continue giving serious attention to the education of my children since their education is the key to their self-empowerment and self-development,” she said.